Microchipping is not uniformly required for pets in Beijing municipality or nationally. However, some district Public Security Bureaus in Beijing have been introducing microchipping for dogs registered in their areas of jurisdiction. Please contact your local Public Security Bureau precinct to find out more about microchipping requirements for pets in your neighborhood. The International Center for Veterinary services (ICVS) provides microchipping services for pets with the European Union ISO 11784/11785 standard microchips currently required by the EU and most other countries. 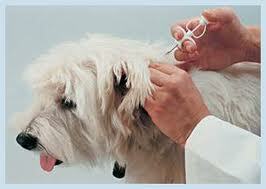 Please contact ICVS for microchipping services for your pets. Pets that are microchipped should still have a pet ID tag attached to their collars. Local animal control and Public Security Bureau precincts are not required to have scanners and will not routinely scan lost and found animals for microchips. As microchipping is not required on a municipal or national level, there is no central database for the registration of microchipped pets. Lost or found microchipped pets cannot be easily traced to their owners. A pet ID tag with the owner’s home and mobile numbers is still the most effective method of reuniting lost and found pets with their owners. ICVS can engrave customized pet ID tags in English and Pinyin. Tags may be engraved on-site at ICVS within minutes. Please contact ICVS for more information about pet ID tag engraving. In November 2011, the Guan Shang animal hospital in Beijing that performs the government authorized exit health examinations, began requiring all animals to be microchipped by the time of the health exam. 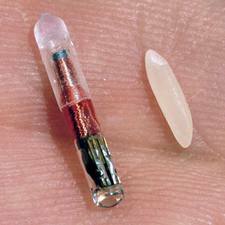 The microchips required are the European Union ISO 11784 /11785 models. Please note that this microchip requirement is NOT an official Beijing municipal government or an Entry/Exit Quarantine and Inspection Bureau requirement. This is ONLY the requirement of the Guan Shang animal hospital. This new requirement was introduced to allow accurate identification of animals at the time of the exit health examination. The microchipping requirement for export from China is not uniformly required throughout the country. Please check with the local Entry/Exit Quarantine and Inspection Bureau of your province if you are departing China from a city other than Beijing. ICVS can help insert microchips for all pets. ICVS can also scan already microchipped pets with our universal microchip scanners. Please contact ICVS with any questions about microchipping for pets. ©2006-2014 International Center for Veterinary Services. All rights reserved.